(Phys.org) —The universe may have existed forever, according to a new model that applies quantum correction terms to complement Einstein's theory of general relativity. The model may also account for dark matter and dark energy, resolving multiple problems at once. More information: Ahmed Farag Ali and Saurya Das. "Cosmology from quantum potential." Physics Letters B. Volume 741, 4 February 2015, Pages 276–279. DOI: 10.1016/j.physletb.2014.12.057. Also at: arXiv:1404.3093[gr-qc]. Saurya Das and Rajat K. Bhaduri, "Dark matter and dark energy from Bose-Einstein condensate", preprint: arXiv:1411.0753[gr-qc]. How well can information be stored from the beginning to the end of time? I gotta see their math. I was just talking about this sort of model yesterday and the day before. I think this is potentially better relativity both at the cosmic level and the local level because it introduces a mechanism to relate mass to space itself via a mediating particle, which is something relativity doesn't do. I got some critics from Ira and another guy about the Michelson Morley experiment and such. I don't see any reason an "fluid" model can't still work to tie gravity and space together in a single mediating substance or set of substances. I will read the paper a little now and some later if there is no pay wall. "Although the Big Bang singularity arises directly and unavoidably from the mathematics of general relativity, some scientists see it as problematic because the math can explain only what happened immediately after—not at or before—the singularity. @ Returnering-Skippy. How you are today Cher and where you at, huh? I'm still fine and dandy again me, thanks for asking. I gotta see their math..
Skippy that has never slowed you down before. Usually you just make up something that sounds like a person with a mental condition playing at being the scientist. Why now you have to see some maths, what's different with this one? Its exact form is not important to our argument however, except that it is non-zero and spread out over the range of the observable universe. This follows from the requirement of causality; even if matter exists beyond the horizon, it will have no effect on what is inside the horizon, including the wavefunction. This still implies no model would ever suffice for the entire universe, but only that which is within our light horizon, which means that the guy on "Science" and "Big Think" was still correct. Even a "Theory of Everything" can't actually model "Everything". Substituting L0=1.4×1026 m, one obtains m≈10−68 kg or 10−32 eV, quite consistent with the estimated bounds on graviton masses from various experiments , and also from theoretical considerations , ,  and . In other words, we interpret the quantum condensate as made up of these gravitons, and described by a macroscopic wavefunction. That is a small particle. That's close to the number you get if you divide a kilogram by the Cube of Avogadro's Number. The reality of the James Webb telescope's infrared capability to see through the sacred Primordial Gas Cloud has finally begun. When the JWT starts bringing into view myriads of galaxies hypothesized by Big Bang Cosmology not to exist, bye, bye BB. The consequence will be that the universe will be proven to be much older & bigger than Big Bang Funny Farm science could ever have imagined. Big Bang Theology will be scrapped to the ashbin of history & redshift theoreticians will be scrambling to rewrite their equations to deal with a new reality of math they once thought was settled science. So, what will Cosmology Science of the future look like without a BB? Standby.....it'll be a fun ride. As engineer, i see the Big Bang as an impulse response h(t) of a system (initial Black box). What did have the black box inside? Well, if it had been empty, the impulse just had passed through wit no change... but is not the truth. May be i will analyze it after i die. This implies that the laws of thermodynamics as we know them are slightly flawed and need corrections. For the record, this actually does not produce an infinite monkey history of the universe, as we can readily demonstrate strings of infinite numbers which nevertheless provably do not contain all possibilities. This is slightly relevant because it still means the universe has one history, or more generally each universe (if there is more than one) has one history. It means that Entropy is somehow a form of order at the cosmic level even though it appears to be disorder locally. This I had suspected already anyway. They will need computer models to understand much of anything beyond our common experience and intuition, because visualizing these corrections is pretty freaking hard. Can it predict future threshold events, such as reionization or the appearance of all-new particles or entity-properties as local energy levels change? This also appears to be a mathematical proof that it's possible for things to exist outside the universe, and that it's possible for infinite reality to exist, which is two key points atheists don't get; the "Who made God" question is actually answered by these equations, in that an infinite Being can in fact exist without cause. Also, I should suggest that a formula showing past infinitude does not necessarily mean that an infinite past actually exists, it simply shows that if it did exist it would have those properties. You can imagine running a finite clock backwards infinitely, but that doesn't make the operation valid. The assumption of constant laws is axiomatic, and does not necessarily hold philosophically true for a sub-set of reality, but only for the fundamental. So the equation cannot describe the entirety of reality, but only the observable universe, though it can imply that there may or may not be things beyond what it can describe. orti: You're missing the idea that the new theories or models do not automatically make it factual and "the word" of science, and other model is wrong. When we don't know how something works with an extremely high confidence level, all we can do is keep building models, proposing theories, etc. The authors of this study likely would not make the claim that their model is "right" and singularity models are "wrong" but instead they present it as a POSSIBLE explanation. You have made other comments that show you need to try and have more of an open mind. You commented on another article, "If, in an ideal environment (earth), life only began once in 4.5 Byr, why expect it to sprout everywhere spontaneously?" I think you're missing several points; one is 100B to 200B galaxies out there, and each contains billions and even trillions of stars. All of the recent planet findings have been in our galaxy alone, only looking at ~150,000 stars of the ~300,000,000,000 in the milky way. It is basic Science philosophy that extrapolation can act as a guide to discovery, new physics, etc. but it is rarely accurate and more often than not not even close to correct. Extrapolating our Laws of Physics into the far past and to energy densities far from what we know doesn't make such fiction valuable. I have a noticed a couple of 'red flag' comments - indicating a abundance of noise without any light. First is talk of those 'parts' of the "Universe" which are NOT causally connected to ours, second is talk of multiverses (which by definition are not ever going to be subject to measurement/observation) and third is talk about visualization of 4 or more dimensional physics. I suggest if you hear any of that in a thread, you ignore the comment entirely, its almost certainly rubbish. If it can't, even in principle, be measured, then it ain't physics. If you think you can visualize a 10 or 26 dimensional universe (or an infinite dimensional quantum universe) I welcome you to try! The theist argue that everything comes from something, therefore there -must- be a God, which gives rise to the question, "who made God?". The whole question is a response to the inherent contradiction in the definition of God as the necessary first cause. If you contend that something doesn't need to be caused by anything to exist, you actually destroy the theist argument; God as a creator, or creation itself as a single event, is no longer necessary for things to exist. Unless you explain why God would be the only thing that can exist without a cause, everything can exist without God. Returners: Not sure how you come to that conclusion... Most of us on phys.org believe it is not only probable that life exists elsewhere, but that it is also highly likely. Not sure how the use of math and modeling makes a case for the existence of a God. And as far as the lack of "hearing" anything from another world that deniers claim... A parallel earth could be down the street just 100 light years away and we wouldn't hear it yet. Now think about a parallel earth orbiting a star that is 100,000,000 light years away (still fairly close)... Something tells me dinosaurs weren't broadcasting RF. In physical terms, the model describes the universe as being filled with a quantum fluid. The scientists propose that this fluid might be composed of gravitons—hypothetical massless particles that mediate the force of gravity. Quantum patch. Are we finally witnessing the death throes of the Huge Bang Fantasy?? LaViolette is way ahead with his etheric fluid model, where space is composed of a multitude of undetectable sub-quantum particles which, under proper diffusive conditions, ignite into a self-sustaining, propagating, transformation reaction that we label a sub-atomic particle. Like sound wave propagation in air, photon reaction propagation is limited by the ultimate transformation reaction speed set by characteristics of the local diffusive medium. And since disturbances of the transforming medium extend well in advance of and into the surrounding medium from the moving photon reaction, the double-slit experiment is easily explained. Sigh yet another who can not understand that atheism does not require an explanation of how it all began or a requirement to prove that God does not exist. The burden of proof for the existence of God lays completely on the shoulders of the theist. If I am to play a game where the eternal disposition of my "soul" is at stake I will get the rules of the game directly from the game master, not some middleman with his or her own agenda. Until that day comes I will live my life the way I choose to and my choices do not require me to convince you that I am right about what I believe. I've yet to understand how space can expand relativistically, if the speed of light doesn't increase to match. Of course, if it did, there would be no doppler effect to explain redshift, since redshift requires the light to take longer to reach the receiver and thus be redshifted. When I point this out, the usual response is "the light is just being carried along by the expansion." Which overlooks the fact that it's the redshift of this light traveling intergalactically, on which the proof of the theory is based. So there is supposed to be expanding space, based on the redshift of intergalactic light and we know this because we can compare it to stable units of measure, based on the speed of the exact same light??? Of course, every time observations refute this theory, some enormous new force of nature is proposed and accepted. We accept gravity is "equivalent" to acceleration, but the surface of the planet isn't rushing out to keep us stuck to it. Couldn't there be some optical effect, "equivalent" to recession, causing redshift. As an optical effect, the reason we appear at the center would be quite logical. If it compounded on itself, it would explain why this expansion curves parabolically and so no need for dark energy. Also the CMBR would simply be light from ever more distant sources, shifted completely off the visible spectrum and so be the solution to Olber's paradox. Or we can stick to inflation, dark energy and multiverses. I can only wonder if another generation of cosmologists will chase after that goose, or will they wise up and push the reset button. @reset: "Recognizing the requirement to deal with "singularities" is a major step forward. Suggesting space is composed of theoretical particles is 11 steps backwards." If you are saying gravitons and the quantum fluid are merely theoretical while the big bang and inflation are not, you are actually standing still and not taking a step in any direction - sticking with the status quo does not equal scientific progress. This theory is seeking to replace one current theory of the universe. If, as mentioned in the article, it fits with current observations and gets rid of the uncomfortable truth that the entire theory breaks down at the beginning with the big bang, it is truly a step forward. The current model of the universe fits well with some observations, as did Newtonian Physics, but just like Newton, there were many areas Einstein did not understand or have the ability to observe. Its only a matter of time before a new theory supersedes it. 1. The drawing is probably incorrect. In all likelihood, the explosion and expansion would be isotropic and thus should be represented by an expanding sphere. 2. The problem with the Big Bang is that it begs the question "What was there before it?". Personally, I favor a cyclic universe which undergoes periodic expansions, followed by contractions, followed by a singularity state (Big Bang), and then repeats ad infinitum. It is difficult to prove this as there is no "memory" across a Big Bang event. I believe Hawking postulated something like this in one of his earlier works. If indeed spirit evolves through multiple incarnations in the apparent physical universe, then if the universe finally collapses, all the spiritual advances of billions of lifetimes get wiped out. As child Alvy says in Annie Hall, if the universe is doomed "What's the point?". Again, if consciousness preceded substance, then the Big Bang start point is a problem, because consciousness is eternal. No big bang, no problem. I like this new theory and am rooting for it. "Ahmed Farag Ali at Benha University and the Zewail City of Science and Technology, both in Egypt"
"theoretical physicist David Bohm, who is also known for his contributions to the philosophy of physics"
David Bohm... "was also, more unusually for a scientist, inspired by mysticism. Indeed, in the 1970s and 1980s he made contact with both J. Krishnamurti and the Dalai Lama whose teachings helped shape his work"
-I suspect religious philo voodoo mysticism. Consciousness is the favored substitute du jour for the soul. It is as fantastical as is god. Um, if the universe is infinitely old then why hasn't all the hydrogen been burned? When things get too dense and the calculations begin to fall apart I don't think you just throw up your hands and say "Well, the universe existed forever" and go home for the day. That's just not a solution worth accepting. This is absolutely fascinating! I have always been a fan of the multiverse theory. The equation will have to predict CMB though, let's just wait and see. TheGhostOfOtto: when you say consciousness is a myth are you saying you are not conscious?? arpt_kh: given that Hinduism posits cyclical annihilation, what does it say about the spiritual advancement achieved in one of those cycles? Is it completely wiped out? Do we all start again as amoebas (or less)? "The clusters appear to be moving along a line extending from our solar system toward Centaurus/Hydra, but the direction of this motion is less certain." In all likelihood, you are right. However, this picture allows one to label epochs and not have other quadrants of the sphere confusing the visualization and type. 2 entirely different things as you know. Or maybe you dont. And if you think they arent then you dont know what you are talking about. "One of the book's more controversial claims is that qualia do not (and cannot) exist. Dennett's main argument is that the various properties attributed to qualia by philosophers—qualia are supposed to be incorrigible, ineffable, private, directly accessible and so on—are incompatible, so the notion of qualia is incoherent. The non-existence of qualia would mean that there is no hard problem of consciousness, and "philosophical zombies", which are supposed to act like a human in every way while somehow lacking qualia, cannot exist." .....yeah, they make it look "anistropic" giving a misleading appearance of the universe beginning at the bottom end of the barrel of a cannon. They always do that because "isotropic" makes the universe look too much like the quasi-sphere that Einstein describes in his GR, or maybe the artists never took an isometric drawing course in college & consequently don't comprehend how to make an accurate drawing. I don't know how many have followed my complaints about the Big Bang Theory or how corrections to make the trajectories of the physically visible universe work through dark matter and energy are philosophically counter-intuitive even if mathematically effective. While the illustration is trying to use 2 dimensions to illustrate a 4 dimensional problem I still have a problem with that "expansion" period and am more of the mind that the "change of state" from a prior universe is probably more closely on track. While a lot of energy had to be injected into the universe for the immense distances and speeds to be obtained it does not therefore infer that it was injected at a point. Perhaps the theory of black holes representing a hole into another universe is correct and that the energy in this is coming from a "lower division universe" into ours via many many "black holes" of theirs. So do we look for the energy sieves? The certainty of the universe having a beginning that involves a big bang may be in doubt, but the certainty that is argument will have no end, is certain. Before jumping on the bandwagon, it would be helpful to remember this is a pure guess. The math is simply window dressing to the pure guess. Was wondering how long before ol' "movementis..." started yackin'.. Sorry but my previous post was for a different article, for some reason it ended up here, but the article I wanted to post is actually closed to posting now. The logic suggests that it's because the universe never achieves its cosmological constant that it is without beginning/end. Not sure how this is measurable. Also, it suggests we live in a potential universe...one that hasn't started yet. Which makes no sense. This goes well with my theory that OUR universe is just other side of event horizon of black hole. Thus multi-bang multi-verse. And other theory that dark matters are universe in different dimension where we are only connected by gravity. Always fascinated by the big bang, very small and hot and having everything in it needed to make the universe, how does that happen? What is before that and where is that from? Think about it, it is mind boggling that there is no beginning and no end. For the big bang, at least we have sort of a beginning. As usual this is extremely interesting yet even in a fairly low tech article I get lost in the jargon and concepts so I have to approach it from an intuitive or philosophical level. But what comes to mind is aside from the mathematical calculations, much of what we understand seems to come from ever more sensitive technical devices. I hope and wonder if mankind can exist long enough to understand and produce such inventions to point us in a definitive direction of the "theory of everything." Personally I prefer a big bang/big crunch model of the universe seeing it as aesthetically pleasing as a continuous, recycling and self contained system without beginning or end. 1. The problem with Bohm theory is that it isn't relativistic. [ http://en.wikiped...lativity ] Enforcing the relativistic Friedmann equations from cosmology is just cosmetics. "the Big Bang singularity arises directly and unavoidably from the mathematics of general relativity,". The big Bang is the beginning of the human race universe , what is beyond that i think our physics cant answer that question for now unless we understand what is dark matter . I've never understood sciences need to believe in systems that are least flawed. Just because we can our current understanding of the universe to measure it doesn't makes those measurements correct. It's obvious the big bang theory is flawed because is doesn't explain time before the singularity. "The physicists emphasize that their quantum correction terms are not applied ad hoc in an attempt to specifically eliminate the Big Bang singularity." At least its not like String Theory in this respect, which I don't respect. I hope you continue to develop this newish theory. I'm not bent to dark matter. Not sure your result that the Universe does not have an age. That gives me doubt. But doubt and proof resolving this is the foundation of physics and all science. I really like what you are doing. So where does this leave Sheldon and Leonard et al? "You commented on another article, "If, in an ideal environment (earth), life only began once in 4.5 Byr, why expect it to sprout everywhere spontaneously?"" As you say, that misses several points. Darwin responded to that question nearly 2 centuries ago: life can only start once (or not, or a few times), because later attempts will be food for existing life. Everyone interested in astrobiology should know this. Instead we can look at how fast life was established on Earth, which means it is easy and/or often repeated attempts, and hence life should be common. This is science fiction and not science. More evidence points to the Big Bang Theory than away from it. This includes the Biblical account of Creation which all these atheist wackos are really trying to undermine with all their malarkey about dark energy, dark matter, gravitons, the Higgs Boson and all the other modern day physics non-sense. Hey, hey, hey there.......the Biblical account of Creation is the Big Bang.....!!!!!! Have you never sat down with a checklist to compare the "stretching" & "inflation" of the two hypotheses of the beginning stages of the universe? In the BB it all came into existence in a flash of an explosion the same as Creation. @qitana: "Cause... if the curvature of space explains how gravity is mediated, the existence of gravitons seems to be awkward as they seem unnecessary". Gravitons is what you get out of gravity when you quantize it same as every other field. It is also an empty "slot" among particles (spin =2, max spin allowed in QP, which no standard particle has - they have 0 (Higgs), 1/2 and 1 while 3/2 is set aside for supersymmetry). However, those gravitons only show that GR is compatible with QP, not that the theory is complete. Existence itself is infinite. It must be. The Big Bang is a remarkable point in time but pondering why anything exists at and HOW everything exists is truly and ultimately inexplicable. @Wheeew: "If the universe has no beginning, and the time it has existed is infinite, then, Shouldn't we already have reach a state of thermal equilibrium (second law of thermodynamics)?" @xtsam: "lways fascinated by the big bang, very small and hot and having everything in it needed to make the universe, how does that happen? What is before that and where is that from?" The age of the local universe is precisely established (at 14 billion years) since WMAP tested inflationary cosmology 2004. What happens is that the universe comes out of a cold, rapid expanding state (inflation), whereupon the inflation field potential energy gets converted to heat (Hot Big Bang). Inflation may or may not be eternal backwards, we can't tell yet, but since the inflationary multiverse (the most likely configuration) has always been expanding it has no equilibrium to attain. Exactly correct, something came out of nothing and impacted with something which created the big bang. Be it internally or externally is unknown, however since we can assume it was of a bigger whole before it expanded, we can assume it had eternity to prepare for it. If inflation isn't eternal backwards, likely it has fluctuated into being - the universe is zero energy and inflation is a quantum scalar field after all - and it has then done so an infinite number of times, making an infinite set of eternal multiverses that stretches back and forward into eternity. That is a good enough solution, since physics makes sense but its absence does not, you can't for example make a distribution on anything else than events. Sorry, I can't help you, you don't make any sense. Maybe you should start study physics? It usually helps to understand the issues before asking questions or commenting on known science. So...if ya don't buy into the big bang - why buy into the creation theory? One gets the distinct impression that no one has a clue. Cosmology seems a horrible was of time. Even if we arrived at the correct account what went down- what would we do with it? Sit there and stare at it like a nice painting a wall? @Returnering-Skippy....Usually you just make up something that sounds like a person with a mental condition playing at being the scientist. ...and it would explain perfectly his Ira-BOT-voting, trolling and village-idiotic driveling. Poor insensible sod hasn't yet realized that all his "smart peoples" (whom idiot-Ira-bot has been trolling-bot-voting and skewing, and people/discussion sabotaging, on behalf of) have now been proven WRONG and me RIGHT. So where does that leave this Ira Moron? Yep, you guessed it, folks...just as wrong as his "smart peoples"; and just as dumb as when "it" first started bot-voting, trolling and driveling here and elsewhere. Poor useless Internet Moron Uncle-bot. Bewitching subject....I'm probably the least qualified here to give an opinion....but I love the theme....do not understand everything is said here but I read it anyway...sometimes the light comes on...one gets a glimpse of something REAL...and big....Other time one gets a whiff of BS....but all in all....I keep on coming back.....thanks. I wonder if their model can be applied to the singularity inside black holes. I would imagine, for consistency, that black holes would also lose their singularity, which might allow the inside of them to be modeled and evolved through time. Hey, hey there...the Biblical account of Creation is the Big Bang.....!!!!!! Have you never sat down with a checklist to compare the "stretching" & "inflation" of the two hypotheses of the beginning stages of the universe? In the BB it all came into existence in a flash of an explosion the same as Creation. So if ya don't buy into the big bang - why buy into the creation theory? .......yeah, just my point, they're the same. Readers here need to know the purpose this article was written, to put the scientific community on notice that they need to begin weaning themselves off BB because it is so close to Creation. There is a small horde of astrophysicists who are just beginning to sound the alarm bells that the James Webb telescope with its infrared spectrometry, will in just a few years hence take a mask off a universe heretofore unimagined. Cosmology will go through a rebirth when the JWT takes pictures of galaxies on the other side of that Primordial gas. It is mind boggling, to say the least! Enough to make you mental! I think the "big bang" did happen and is responsible for life on this planet, and changes that took place on other planets within this solar system and was with the explosion of a planet, in it. lol! Works for me perfectly as it just makes sense to me, and is consistent with Buddhist cosmology and insights. I am that I am, therefore so was the universe, if you believe in a God or whatever the Supreme Being is, then the universe had no beginning, it always was!, just as God always was! Very difficult for the human mind to comprehend this because we can't conceive of a "no beginning"
If you were a Supreme being explaining to your creations how they were made (children always ask where babies come from), and intellectually the Supreme was as far separated from his creations as we are from lab mice, how would YOU explain the Universe's beginning.. Let there be light, separating the heavens from the firmament etc makes a lot more sense as a way we would explain it to first graders doesn't it? Its a massive oversimplification of an unfathomable answer. We cant know EXACTLY how the universe began, nor Exactly how it will end. We didnt see it start, we won't see it end, and we have already missed a lot of the best parts. Math and physics continue to refine by degrees how close we are to a "True" answer. whether it is explaining gravity,time, or matter. The real truth is realizing that the rabbit hole really does not have a bottom, only levels, and a door that goes down -when you find the key. But the truth is, the evidence against Big Bang existed from its very beginning - even his co-author Edwin Hubble was aware of it. .......and as the Big Bang goes, so goes Creation, they are one in the same. Cosmologists have for years been trying to figure out how to beat back the methodology of Creationists adopting many of the principle tenets of BB. They see their opportunity with the JWT, that it will discover that the vaunted Primordial Gas Cloud is not what they have assumed it to be, the edge of the universe. If the JWT spots galaxies opposite the Primordial Gas, down the tubes goes the BB & cosmologists will be freed from the chains Creationist theology. Cosmologists want as much distance between themselves & Creationists as possible, and they get it if they can get pictures of galaxies opposite the Primordial Gas; ummmmh, tongue in cheek here, they're praying for it. I don't know if anyone has mentioned it but: what about the loss of energy over time? Since we can visibly see objects losing heat energy faster than it can be gained, wouldn't that still mean that at some point a massive amount of energy had to be inserted into the universe? I know people love looking into the past for the answers about our now, but in this case I think pondering about the future would be more helpful. What happens after all the energy in the universe is back at 0? Does this paper even comment on entropy at all? It is truly miraculous how God used only a finite amount of time to create a past infinite universe. So this model is compatible with our interpretation of red shift (SR's reciprocal time dilation makes it unnecessary to correct red shift for any time dilation effects). It will not be compatible with our interpretation of red shift if we use directional time dilation from Lorentz's Absolute Transformation. In that case all of our cosmological measurements will require significant corrections. I think it's about time we nailed down whether reciprocal time dilation is in fact operant over cosmological distances. Or any distances, for that matter. Thus far experiments demonstrate that time dilation is real; but except for GPS, they don't tease out the difference between reciprocal time dilation and directional time dilation. And for GPS, directional time dilation is the only solution that yields accurate geopositions. Funny how western educated science buffs and physicist believe there has to be a beginning and an end to everything, Where as many Asians believe that there is NO beginning and an end for/to the universe. Matter keeps on transforming and trans-mutating from "one form" to another. It never did occur to me that there was a beginning to our universe. It seemed obvious that after a certain amount of time (less then 200 billion years) that gravity would pull together enough mass to create a big bang, probably happening many times. I said less then 200 billion years because protons can only last that long. I have not done the math for what happens to properties without the 'drag' factor. Glad to see the demise of Big Bang an irrational hypothetical construct without scientific rationale since the mass at this event would have to be infinitely large to account for the cosmic debris, aka galaxies and who would push the button? Far more rational is relying on supernatural explanations such as formation from void or nothingness at infinity past, not natural scientific explanations that fail to explain humanly unknowable pre Bang events. common sense, logic and everything else will tell you space is infinite, time is infinite therefore the universe is infinite, if its not then whats there? solidness? a wall? think about it, if there is an "end" to the universe or space whats there, a road sign? "you have reached the end of the universe" .. "the end of space is forward another trillion billion light years" .. "have a safe journey"
God created things in such a way that only those who truly seek him WILL find him, so we can believe whatever we want to believe - it's called free will. But a being that lives outside of our reality, who creates our reality, seems more feasible to me than matter creating itself from nothing. There has to be some intelligence there to "think" it into existence. Matter has no intellect - it simply is. When something IS created, it's done in a lab, by intelligent beings - US. And even then, it's only a rearranging of atoms that already existed in another form. But since the existence of a being outside of space/time can be neither proven nor disproved, perhaps a better argument for atheists would be to simply say, "I don't WANT to believe." I'm always bothered by things like this. Since time began with the Big Bang, the concept of 'before the Big Bang' is nonsense. There was no 'before'; you can't have a series without time. Therefore, you can only have events happening post-bang. It's about at this point that my head explodes from trying to wrap my brain around the article. Science needs another English tense. "Using the quantum-corrected Raychaudhuri equation"
Heh. Well, if the universe has no beginning, the attempts by scientists working to prove this have no end. Fair's fair, I guess. IF "with big IF" this theory happens to be true with no beginning and end of universe. Does that also mean time is illusion/unreal? "The Big Bang singularity is the most serious problem of general relativity because the laws of physics appear to break down there,"
Well, just how far behind the times were these people when they figured this out. The backwards extrapolation to a singularity using relativity dates back to the original Big Bang notion, which has long since been replaced by the much improved idea of cosmic inflation. Einstein's equations work well for the present, future and the past, but only back to the point where extreme conditions cannot be explained by relativity, and thus require quantum interpretation. The possible complexity of the quantum concept of inflation also includes the premise of a multiverse, and the probability of infinite extensions into both past and future. Current cosmological discussions don't even mention a singularity. 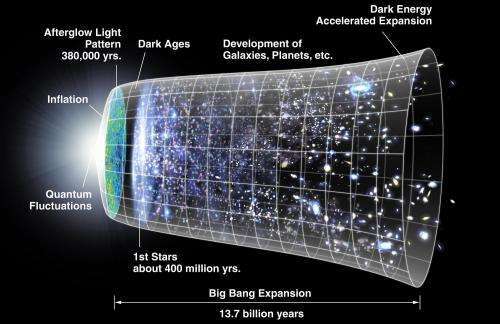 Big Bang cosmology is incomplete. General relativity is an approximation of space and time -- singularities described by GR should not be part of a valid model of the universe. Believe what you will, quantum gravity or an act of God, but the BB model as it exists must be wrong. BTW, the world isn't flat and the earth revolves around the sun too. Wake up. At the risk of being very basic...I am human! I suspect that most other posters here are too. So we look around us and everything we see begins, grows then dies. When 2 items crash into each other something else begins. We see change all around us and that's where the problem is. We infer that everything has a beginning and an end or at least changes to something else. Even at the Q level we collide 'particles' to produce other states. So it becomes comparitvely easy to infer that the universe had a beginning and will end/change. That, of course, doesn't make it right. I don't have a problem with an infinite universe but I do have a problem with an UNCHANGING one. I view the BB as state that produced by another immediate prior state which had probable result states so that in a strange way both types theory can be correct which is not that different to what Losik posted about BB not completely wrong...smaller BB's. Perhaps a complex form of Markov Chain? Too simplistic I guess! seems kinda obvious that even in the traditional big bang model it would never "end" either as the singularity formed after the "big crunch" would explode into the big bang as soon as it was formed right, instantaneously? much the same way there is no discernable single point in time at which the universe was at its "furthest" point of spreading out and the time it starts shrinking back in? that is to say, there is no actual point in time between when the universe is expanding and when it is shrinking, as there is no actual point in time between when the universe is shrinking and it is expanding again. simple physics and Xeno's problem of motion. Yup...there was something happening before the big bang- it didn't just happen inexplicably. we're getting closer. look through a micro scope, then a telescope, it's all there. Always has been, in some form or another. "The theist argue that everything comes from something, therefore there -must- be a God, which gives rise to the question, "who made God?". The whole question is a response to the inherent contradiction in theist argument"
Asking the question "who made God" actually seems to miss the theist argument from first cause. Theists in this are arguing that everything within the universe seems to follow this pattern of causes where nothing arises from nothing. So there would seem to be something outside of the universe, and so outside the laws of the universe, that could act on it as a first cause. A thing outside the universe and its laws that can act on it are attributes of what people have always called God. To move from this to a Christian god is something else, but that isn't what this argument was designed to do. So, the question "then who made god" seems to miss the point that it is claiming something has to exist outside the laws that govern the universe - like the law maker. Wow, so many crackpot arugments here. But I just want to understand what on earth is being proposed here. Are they saying that there was just no singularity or are they saying the whole picture of the Universe expanding from hot, dense matter is wrong (as if it expanded from a very hot, dense state, that is still a lot like a "Big Bang" even if there is no singularity)? Interesting theory. I am sure a lot more science/peer-review needs to be done before the Big Bang stops being the mainstream view but, all in all, not a bad idea. As for the theist worldview it doesn't really matter: religion/faith in the creator existed before the Big Bang model and will continue once it is (or if it is) gone. The eternal age/state of the universe used to be the standard view in the older church age and it was no problem. EPICURUS--atoms moved ceaselessly in an infinite void, constantly forming and reforming the world said that "there are infinite worlds"
Anybody remember Calabi Yau Manifold? Now, take that and imagine it with even just a thousand more variable strings. What do you get? 500 years from now, students will be saying - "man, those people back then thought our Universe was the center of things?!?" why not "nothing from something"? The "...from nothing" never really worked for me. While "something" has existence, "nothing" does not. "Nothing" is not vacuum, but complete absence of everything - including dimensionality/spacetime. So in effect if "nothing" existed it would have no time and no duration - it would be over in (less than) an instant. The "existence of nothing" is a contradition in terms - and by extension "existence" is a tautology. No beginning and no end, back to the steady state model, but then how to explain the light from most everything in the universe being red shifted? "the universe as being filled with a quantum fluid" What? They've revived the aether theory again without telling us? Looks like new ways of retelling some of the oldest theories of the universe. Quite funny comapring to 13th century St.Thomas Acquinas on the beginning of the Universe. "Nothing" is not vacuum, but complete absence of everything - including dimensionality/spacetime. The probability that this theory,whether true or false, is relevant to humanity's evolution is vanishingly small. And please mop up any vacuum leaks you find on the laboratory floor. Vacuum leaks are a choking hazard. Read this (and don't choke while laughing). I don't know if it's true, but it sounds like it might be. If it goes through 'bang-crunch'-cycles then during the crunch stuff gets compressed into quark gluon plasma (or even further down if there is a 'further down')...and during the 'bang' that crystallizes back into subatomic particles which reform into atoms. About the origin of dark matter please see:A New Scenario for Integral Universe Dynamics When Late-time the Polaritons could be Dark Matter Particles? How old is the universe? Age is an expression of time. The universe expands. Is time a result of such expansion, or an intrinsic part of what being a being in the universe entails? First define the idea of the word "time" beyond a mere measurement of duration. Treat "time" as a dimension and plot events in 4-d. This is the only sensible way to think about things over such huge distances and times. Isn't it kinda doing that ALL THE TIME? That's GOTTA be doing something, right? Of all the thousands of gods worshiped over the centuries by many different cultures across the globe, which god exactly is it you are referring to? @losik: Very interested in your commentary here. You're making a lot of hay out of the "Pioneer Anomaly", but FEA of the spacecrafts' expected thermal emissions produced anisitropic radiation pressure and tracks that lined up exactly with their actual trajectories (see http://en.wikiped..._anomaly ). So there isn't really any anomaly left to claim, and the blueshift you describe from the Pioneer maser is fully explained without resort to new physics. Does this falsify your idea, or just put it back into the category of "we'll see"? I appreciate the work involved in coming to the conclusion the universe had no beginning. However, Christians already knew this. We just did not know how to mathematically figure it out. It may take an infinite amount of time to decide whether the universe has been around forever or not. Statistically speaking this theory needs to jump through some major hoops. If the universe had no beginning it has no end. The odds of us being on the time line where we would see signs of either end to the universe are infinitely small. We see light from over 10 billion years ago and the universe looks different. We are not in a universe that has existed infinitely long or will exist infinitely long. The odds are infinitely huge that if we were in an infinite universe we would be near the middle of the time line and infinitely far from either the past or the future. Physics and Math are TWO DIFFERENT things. There are no points or infinities, and nothing is continuous in Physics, these are concepts in Math. Everything in Physics is discrete including time. Thus any theories that assume any different conditions must be wrong from the very start. Many wish to play smart all the time pretend they know better when all they merely buy are this same bogus ideas, feasts on theories made up by people that "thought" the universe must have started this way or that holding no absolute knowledge of the past, but claims that their understanding is factual or true. Bla bla this, bla bla that. Tomorrow another theory comes out to debunk the other. Games of the fake geniuses. This all is like selling a bad pharmaceutical product waiting to be discovered useless. I'm glad to see that cosmologists are finally starting to catch on. The scientific community has been tirelessly trying to resolve the irreconcilable differences between the Theory of General Relativity and the Quantum Theory by, IMHO, splitting hairs. If we are to run all that tweaking and splitting hairs by Occam's razor, they would fail miserably. Also, "singularity" is not the only problem between the Theory of General Relativity and the Quantum Theory, the loss of particle/system data, namely the "wave function," at black holes according to Einstein is even a bigger irreconcilable difference. I believe it's time the scientific community started thinking out of the box of the already fatigued Theoretical Physics. It's gonna be so much fun to watch the creationist react to this. I'm sure they'll see this as a proof that science is wrong and God exists. This isn't science. It's speculation dressed in a white lab coat and lab goggles. so the simple question is what is the predicted mass of this graviton and we can empirically test this hypothesis by seeing if the particle it predicts exists. I don't understand why using quantum trajectory is superior to using classical geodesic... Is it for the sake of simplicity? Isn't that sort of affirming the consequence? If truth, then simple. The equation produces simplicity. Therefore, it is truth...? Someone explain to me, pls. -The ever-increasing expansion of the universe: Any of our observations and measurement in redshift appears to completely contradict this model of a spatially finite and eternal universe. Additionally, if the universe indeed had a finite spatial boundary, then ergo something would have to exist on the other side of it. Also, observationally what is causing this increased acceleration if dark energy is simply written off in this "theory"? - Applying quantum mechanics to macro scale general relativity is tenuous at best: If this theory actually effectively incorporated the two, I'm sure it'd be getting a lot more attention than it is. A theory that poses more questions than answers is not a theory. I did the math and you do not exist. Because you were never there to see it happen and all you can do right now is speculate, run your math and calculate till you rot. No one will ever accurately figure the exact origin or beginning of the universe. Those who pretend to find answers and clues are the biggest liars and scumbags we can find today. They'd play smart to outsmart others and get paid with a glamorous Oscars award, only to be corrected and debunk the next day, and that other person that manage to build and debunk the previous theory gets a pay as well... And the cycle goes on and on yet nobody ever gets the actual information of the past. Only for those who worship science that loves this toys for their bragging rights with the knowledge they have that keeps breaking apart everytime. How many medicine products that have "scientific claims" are later ban and pronounced useless? How does science today actually portray fact from fiction? The most I saw were in Hollywood movies attracting millions and millions of movie goers and fan clubs. Gives us this dire sense of incompetence from today's scientists educational attainment base on bogus knowledge of reality. Start with Evolution theory, the biggest scam of the century. -The Cosmic Microwave Background,if there was no big bang, what caused this almost uniform signature across the whole of what we consider to be our cosmic horizon? The CMB theory will be 100% scrapped if the James Webb telescope discovers galaxies on the other side of the Primordial Gas Cloud. -The ever-increasing expansion of the universe: Any of our observations and measurement in redshift appears to completely contradict this model of a spatially finite and eternal universe. The present calculation for redshift will be totally scrapped because it is based on a 13.7 Gyr limit within the Integral by which redshift calculations are made. The distance between intervals of redshifting shrinks the closer the calculation is made to the limit of 13.7 because redshifting is assumed not to be a constant. The one he feels a connection to of course. And he's allowed to believe it as much as a person is allowed to believe that 75% of the matter in the universe is completely undetectable other than an effect it is claimed to be having, or that all of the matter in the universe was once "a point". Better take a look at what YOU think is possible before judging what someone else does. But highly evolved complex life such as we see depends on a very lengthy string of conducive events and conditions that can't be expected to be so common. Potentially even unique when coupled with the anthropic principle and the possibility of a quantum landscape. Just like that we are going to toss a theory that has made accurate predictions for many years now? As one comment above noted, Wilson and Penzias verified the cosmic background radiation that was predicted by the the Big Bang Theory. Are all the good physicists who have been working with this theory for years wrong? A little perspective is called for. It is akin to saying which popcorn popped first. You would have to be there to see it. Instead - looking back we can only say that a lot of corn popped. The schematic (drawing) uses a PAN diagram (2 dimensional thinking). In space of course we have 3 dimensions. PLS open color chart of elements. In the first round of bangs, gasses formed simple elements. As Suns got hotter more complex items. Very large suns (lots of heat) created Iron, Gold, etc. These are the heavy metals. Think of it as many little bangs, rest; bigger bangs, rest; and then even bigger bangs. Eventually you get to now, where Suns start and die off all of the time. *Adding Physics Humor * Let us go up into a space orbit and see how far popcorn could fly in zero gravity. I was always of the view that the Big Bang was an illusion. Similar to looking down railway tracks to see them converge at one point in the distance. If space is expanding in all directions and at an expanding rate this sounds more like there is a constant creation of new space coming from every point in space. This would look exactly like everything is flying apart in an ever increasing pace and eventually at some distance it would be expanding faster than the speed of light and the continuing expansion would look like a microwave background radiation due to the redshift of the negative event horizon ... the place where light sources are just about to travel away from us at faster than the speed of light and become invisible to us. Is this the Age of Bltherers? We invent the graviton? Sounds like phlogiston and aether. Physicists are starting to sound like economists and sociologists. Fred Hoyle had a theory of Continuous Creation that was a leading contender back before the Big Bang theory. This theory would seem to require a similar injection of matter and energy on a continuous basis to get around entropy (maybe not, I'm just going by my initial impression). Of course Hoyle couldn't explain why we didn't see the new matter and energy. Perhaps he was just a step away from hypothesizing dark energy and matter when he got blown out of the water by the Big Bang theory. A much more basic set of questions involves the continued existence of hydrogen. In an infinite universe, hydrogen would have been gone a long time ago. My old friend John Dobson (rest in peace) was a big critic of the big bang, but I could never get an explanation out of him about the regenerative nature of the matter that we see everywhere. It will be interesting to see how this plays out. So much passion and quite often myopia (it's almost like politics at times). It seems like one of those puzzles where a certain piece may 'fit' perfectly, but the more you look at it, you know that it just isn't right. Science is discovery and re-discovery. Love it when a new (or recycled) idea stirs the pot a little. It makes us work harder to understand our own views. It also bumps my stock in Advil. And yes, I was totally joking about Pringles. LOL... like someone could ever come up with a better chip... laughable! Seriously, I must say that it is refreshing to see mostly respectful conversation on such a controversial topic. Actually, the theists argue that every NATURAL thing comes from something. But the laws of physics and nature to not apply to something outside of those systems. Therefore, since there must be a beginning, the Thing That Has No Cause must be something completely unlike anything else that we know of, and must be OUTSIDE of the whole system, and not subject to its laws. Relativity equations are apparently still considered the holy grail by physicists who like to write stuff. But Einstein once doctored those equations to satisfy his static universe theory, which was of course false, so while the concept of relativity has been proved and substantiated, extending the equations, as they are doing to Big Bang theory, is going too far, IMO. That just leads to more false assumptions. The hydrogen atom is smaller than it was at the time of creation. That means that probably everything is shrinking all the time, but this being a quantized reality, we can assume that this is a process that will continue until some quantum threshold is attained, at which point everything unravels and becomes nothing again in short order. All the while, the universe continues to create at the periphery, where space, time and matter begin. These processes continue. The universe had a beginning. It is untenable to believe otherwise. Ocham's razor. This is exactly why Brian Williams took a few days off... to help these guys with this model. I want to see the equations. Where are they. I will not get too excited, I have seen this before. At the beginning, there was nothing; no space, no time. As such, I find it entirely plausible that there could be an effect without a cause. Perhaps both happened at the same time, the effect being the quantum fluctuations and the cause being that such fluctuations had a probability greater than zero. This makes sense to me as, in the case of nonexistence -- the "nothing" that was the truth prior to the quantum fluctuation, any existence would have been the end of the nothing; when considering all the possible forms of "something," it seems > 0 probability -- frankly, highly probable -- that something would happen. Now someone PLEASE tell me they understand what I've written. Novice here, with a novice question. Does this theory eliminate dark matter or re-purpose it? Many thanks in advance for an answer. If there no begining then there is no end. Everything just change from one state to another. I like this concept a lot. Not too bad jfkril. Maybe a little too fast. If you start with nothing, nothing can happen. So change it very little , start with nothing that allows unused time to accumulate but where the amount of unused time accumulated is zero. This is close to nothing. Then go from there. I need more info!!! My mind is going crazy right now. Can anybody link me a more in depth article? Sounds interesting. Until you apply basic common sense. If the universe has always been here, what changed about 13 billion years ago to have the stars suddenly start forming? From observations of current stars, understanding of how they form and function and the concentrations of heavy elements in the observable universe, that's a pretty safe number for when stars actually started forming. The Big Bang theory provides a simple explanation for this, as that is when particles slowed down enough to start being drawn together. And Benni; redshift thought to be from galaxies moving away is from photons aging. All of physics is 10 time simpler that way. And the math is identical, you can not tell the differences in the math. Yeah, I'm a novice as far as hard science goes (my degree is in political science), but I've always been fascinated by physics and general relativity, and I certainly understand more than the average American, but my knowledge of quantum mechanics is a tad less than standard model physics, so I'm just curious about something. If their model turned out to be correct, then what in the hell is causing redshift? And why would essentially every single bit of observational (and other) evidence we have almost exclusively point to an expanding universe, if we actually are in a steady-state one? And would this model essentially replace general relativity, or just supplement it? Because to me, it seems that GR pretty much nails things like gravitational lensing among other things. Again, I'm a novice, but I'd really like someone to reconcile redshifting with this new potential model. Well, nothing, they always were there." No. We know that stars have a life cycle. They form, burn through fuel and form elements through fusion and eventually run out of fuel and "die" in one of several ways. This is observed and fairly predictable. If stars have been around an infinite amount of time, all fuel would be used up unless there were an infinite amount of fuel, which of course, would have produced an infinite amount of heavy elements, etc. Unless they can show that something changed 13 billion years ago (or at least posit a good guess at what might have) then this is just another math magic trick. The world is full of them. STEP 1 : Due to minute gravity pull, They start to create cloud formations, gaining mass here and there. Not in one location, but many locations in space. STEP 2: Particles in larger gasses start bumping into each other to create mass. STEP 3: E=Mc2 mass and energy for a very small Sun, most probably unstable, which explodes Heat and mass creates a few new elements. NOTE - Now let us also imagine Multiple clouds in space all doing this like fish giving birth in the ocean. Creating multiple "larger and larger popcorn explosions in space" and eventually you get the periodic table, as well as the messy universe we live in. I will pause here so you can have time to review. Do you know how "redshift" is calculated? "To restate, couldn't singularity based cycles of expansion and contraction still be part of a universe that has existed forever?" It could, but that doesn't eliminate the problem that the math breaks down at the singularity. The whole point is that the current math models can't explain the observable universe, so the observable universe must be altered to fit the math. It seems to be a common trend by people who call themselves scientists now-a-days. If you look out at an existing nebula there is a TON of activity, expanding and contracting, new and dieing, the nebula itself is a rather large "cloud" with lots of gas, lots of solids.
" 'The Big Bang singularity is the most serious problem of general relativity because the laws of physics appear to break down there,' Ahmed Farag Ali at Benha University and the Zewail City of Science and Technology, both in Egypt, told Phys.org." Hmmm, that sounds like something which would occur outside the natural order of things- like something supernatural. Well, science is finally going somewhere! I'm not a scientist, here are some borrowed thoughts from R.C. Sproul and K. Mathison, "Not A Chance-God, Science, and the Revolt against Reason." "Origin of the Cosmos: 4 Options: 1.The cosmos is an illusion-it doesn't exist; 2.The cosmos is self-existent, and eternal; 3.The cosmos is self-created; 4.The cosmos is created by something that is self-created. Options 1 & 3 can easily be eliminated (self-creation is logically impossible). If the cosmos is self-existent, is EACH PART of the cosmos self-existent or is SOME PART self-existent and produces/causes the other parts? I know that I'm not self-existent, neither is my watch. We were brought into existence, we're derived, dependent, contingent. If then ONE (more?) PART(s) of the universe is self-existent and has the power of being within itself so it can generate lesser levels of existent reality, then we have attributed to this mysterious being-within-the-universe the attributes of a transcendent God. A rose by any other name...."
I am pleased as well to see the authors credit David Bohm as their inspiration for this effort. Good on you Canadian Prairie boys!!! Stone Megalith Builders of Old.... they used their golden brain glands, pituitary and pineal (brain boosting bandwidth DMT) and we do not. Dark Energy and Dark Mater are the properties of space that are being created by the expansion of space. Space and its contents are not being rarefied by the accelerating expansion of the cosmos. The cosmos is growing and getting bigger and the dark mater and dark energy are the precursors of regular mater and regular energy we are more familiar with. The cosmos is very uniform from our perspective. This can be explained by new space and new mater and new energy coming into being everywhere in space. As more space exists between two farther points the speed that they are moving away from the expansion increases in an accelerating pace till at more than 13.5 billion light years away the light is moving faster than the speed of light and cannot be seen. What we see as the microwave background radiation is just the red shifted light of the cosmos just before it hit the speed of light and becomes invisible. The universe is infinite and has no beginning in time or place. Just because pseudo skeptics always resort to saying such things as, 'the burden of proof for the existence of God lays completely on the shoulders of the theists' does not make it so. That is a typical pseudo skeptic deflection of questions asked of which they have no idea how to answer. The likelihood of nothing (an empty set) is zero. All physicists and mathematicians will recognize this in any of the forms (norms) written. That provides you a setting(s) for an event and an event. The primitive notion here is an empty set. Anything..... Give me anything but that idiotic big bang crap.... how anyone over 5 years old could take that seriously is simply amazing. Scientists should get up every morning and go to the mirror and ask the rarely asked question, "What is my relationship with Reality" most (no, all of us) who have ever done this came away with the honest answer. "I do not have a relationship with reality." Well said! You have succinctly put your finger right on the causal non sequitur between 'nothing' and 'something' in physical arguments re 'beginnings'. Cheers! There is no 'outside' in eternal infinite all-inclusive 'universal set' of phenomena/state 'potential' which is 'processing' and 'cycling' ceaselessly though all local/collective epochs and states of possible realizations/manifestations of physically effective features and dynamics. So that Calabi-Yau and other 'representations of 'universal shapes/curvatures/topologies' etc are actually misleading because they are 'finite' possible 'subsets' of dynamical processes within any particular local volume/epoch. Cheers. Because there is constant recycling via energy/plasma jets of 'deconstructed matter' from the dynamical evolutions and processes at every scale. On large scales like neutron stars, black holes/quasars etc etc. So Hydrogen is being regenerated in polar jets of deconstructed heavier atoms produced in novas/supernovas etc. Why, even at the quantum scales, there is energy-space perturbations (high energy content photons/gamma rays etc) interacting and forming 'particle pairs' of Electron-Posiron matter. And of course, the latter may at some other place/epoch interact to Annihilate themselves back to gamma ray photonic energy again! It never stops. What we are observing 'locally/now' in 'observable volume' is merely one 'present' epoch of 'states' that represents one such epoch/stages of an infinite/eternal series of construction/deconstruction epoch/stages. Cheers. Consider an infinite volume with eternal processes going on within it and all around any chosen 'observable volume' such as 'ours'. Over the epochs of radiation from every direction incoming/outgoing to/from 'our' volume would have 'averaged out' base 'flux' of all sorts of radiation contributing to what we 'see' in any chosen part of the radiation spectrum. The combined effects of local (in our volume) and far sourced radiation would give the observed spectrum irrespective of BBang etc 'beginnings/finite' universal volume/process hypoheses. Apt description of BBang etc. hypotheses! Hence mainstream unease with what's been claimed for BBang etc to date; especially inflation/expansion 'interpretations' of CMB data. Cheers. hat's because everyone was missing the obvious re energy-matter 'recycling processes' of pair production/annihilation (quantum scale) and polar jets deconstruction/reconstruction (macro scales). Please see my above posts addressed @ppnlppnl and @Traltizer for more info. Cheers. "Unless you explain why God would be the only thing that can exist without a cause, everything can exist without God." Well, for one, you could define God as "that from which everything arises." That solves the philosophical/rational problem. One can then say that God's source is God, by definition. But that's probably not satisfying, and obviously a circular argument. Which is not to say it's a false argument however. It makes perfect sense to say that reality is circular in nature. It goes back to the ancient argument that everything is made or comes from "one thing" or even "oneness". Advaita, for example, means "not two". It also means "beyond two". Thales' proposition that everything is made of water as the essential element doesn't seem to make much sense empirically, unless "water" is taken to be symbolic. Of what? The most sensible proposition is "consciousness", since that's a common symbolic usage of water. The "ocean of consciousness" as the primal source.